Jacob Edgar, ethnomusicologist and owner of Cumbancha Record Label, runs his business from his home in Charlotte. Jacob and his wife, Deirdre, have made some incredible sustainable improvements with their home- which is a farmhouse originally built in the 1830’s. Their property consists of the main house, a recording studio and an office in a separate barn. One of their biggest accomplishments is that their home/business is NetZero with electricity due to solar panel installments. For their solar project, the Edgar’s decided to use SunCommon as their installer, whom they were very pleased to work with. Jacob said that SunCommon makes it very easy for their customers to get started on projects, the company comes to your home or business for an evaluation and generates a deal (a flat monthly price) for financing the installation. SunCommon told the Edgars how many panels they would be placing, how much electricity it would create and the rate that you will pay and the rest is left up to the company. They work for you to find certain subsidies and grants to help you fund a solar project based on your situation. Edgar stated that they didn’t need to go through any efforts applying for financial assistance, but recieved subsidies through the work of SunCommon. Cumbancha has been NetZero for around five years, Edgar stated. The couple mentions that they have been continuing their sustainability goals by switching to electric appliances for their both their home and business, and trading in their gas vehicle for electric. Because of this, they see themselves adding an additional solar panel in the near future to make up for their slight increase of electrical demand. 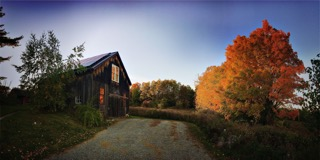 Cumbancha has integrated other sustainable practices for their property, including bringing Efficiency Vermont to their business/home for an "energy assessment" on the property. Being a farmhouse from the 1830’s means that there is likely a lot of room for improvement. The couple invested a lot on leaks and gaps, making sure that their business and home was weatherized to its full potential. The couple did as much as they possibly could initially without worrying too much about the return on investment time frame for the sake of the environment. They source heat for the various parts of the property with wood heat in the main house, propane in the recording studio and an electrical heat pump in the barn office. Additional ways that the Edgars ensure that they live sustainable lives include the simpler things such as turning down the thermostat in winter and turning up or off the air conditioning in the summer. In their business, they regularly turn off equipment during non-operational hours to cut back those useless energy demands, as well as getting rid of any equipment that was unnecessary. They also have compiled their solar information to share with Jacob’s clients. Cumbancha is a great example of a business who has fully taken advantage of SunCommon and Efficiency Vermont’s offerings, as well as being conscious of the little things as well.